By concentrating almost single-mindedly on the goal of a manned lunar landing, secondary considerations like landing accuracy and science had taken a back seat. In the event, Apollo 11 had landed about seven kilometres beyond its planned site and, for some time, no one knew exactly where they were. Not even Mike Collins had been able to see Eagle through his sextant - a powerful optical instrument built into Columbia's hull. The mission's science payload had been severely limited through weight constraints and lack of time. Future missions would make amends because America had invested heavily in the infrastructure to support Apollo and wanted to see it used. It also demanded justification for the continuing costs. Fittingly, science became that justification. To gain knowledge from the Moon, NASA had to go to sites where Earth-based and orbital imaging suggested that answers to questions might lie. However, given the limited walking range of an astronaut on the lunar surface, the ability to land at a given target became paramount. 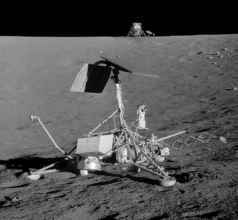 Although Apollo 12 was not sent anywhere of particular geological importance, it was given a very small target to aim for: Surveyor 3, a small robotic craft that NASA had sent to Oceanus Procellarum, 31 months earlier. Having courted disaster by flying through a rain cloud and invoking a lightning strike on their vehicle, the Apollo 12 crew continued to the Moon amid fears that their command module may have been damaged by the surge of power that passed through it. In the event, the CSM Yankee Clipper proved to be unharmed and on 24 November 1969, Charles 'Pete' Conrad and Alan Bean landed their LM Intrepid, 1,500 kilometres west of where Eagle had landed and only 200 metres from Surveyor 3. This pinpoint landing demonstrated that ground controllers and crew could bring a LM down exactly where they wished. Richard Gordon, orbiting overhead, confirmed their position by spotting both the LM and the Surveyor probe on the surface through his sextant. The unmanned spacecraft, Surveyor 3, with the Apollo 12 LM Intrepid beyond. autonomous scientific station, which operated on the lunar surface for many years after they left. The next day, they hustled across the surface in a circle for over a kilometre, stopping at preplanned points of interest, ending with a visit to the Surveyor probe. After examining and photographing the probe, they removed pieces to return to Earth where researchers could study the effects of 31 months' exposure to the lunar environment on the equipment. In terms of public relations, the low point for this fun-loving crew was when their television camera was ruined early in their first moonwalk by being inadvertently pointed towards the Sun. TV networks struggled to provide a visual accompaniment to the crew's voice communication and audiences quickly became bored of listening to indistinct and often arcane yakking by the two guys on the surface. Nonetheless, like every crew after them, Conrad's and Bean's two joyous forays out on the surface yielded samples of greater bulk than the previous mission, and the scientists were more than happy with what they brought. In particular, tiny grains of a very slightly radioactive rock type began to lift the lid on important aspects of the Moon's early history. Despite the lightning strike that punctuated Apollo 12's departure, Yankee Clipper's splashdown ended a successful, if charmed, 10-day mission that was marred only by the loss of TV.